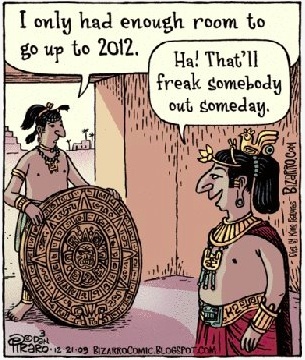 Maybe the Mayans Were Right About 2012? With only five weeks to go before 2012 arrives, there are several plausible candidates for the “end of the world” that every New Ager has been eagerly anticipating since Mayan calendar fetishism replaced the made-up Kwanza holiday as the favorite diversion of the trendier-than-thou set. Right now the leading threat is the Eurozone crisis. It is looking more and more as if financial Armageddon is inevitable at some point, with the British foreign office warning its European embassies that rioting might break out in the aftermath of a Eurozone breakup. Meanwhile, the excitable Tyler Durden of ZeroHedge.com observes that what we may be watching is the Germans working a de facto financial Anschluss of the weaker European nations, achieving a sovereign takeover of weaker European nations through banks what they failed last century to do with tanks. Hmm. Puts in a whole new context the breathless comment that some potentate—Merkel? ?—made a few weeks back that the collapse of the Eurozone would mean war. So: banks or tanks? Take your choice, Europe. Not all of the special issue is available online, and one of the features not posted is a piece from Rolf Heuer, the director of Europe’s CERN laboratory, where next year they expect the Large Hadron Collider to be ready finally to test to see whether the Higgs boson particle exists. Nervous nellies have worried that the particle smash up necessary to generate a detectible Higgs boson will create a tiny black hole that will swallow the Earth and maybe even our entire solar system, which will certainly upset the Eurozone economy if it does. The New York Times and the Washington Post, meanwhile, will blame the Bush tax cuts for the end of the world, because our supercolliding Supercommittee couldn’t even generate a boson-sized tax increase agreement.